Hoppy Easter friends!! :) Sorry, I know that was corny, but I love Easter. Yes, I know the true meaning of Easter (not the coming of the Easter bunny), but the reason I absolutely love Easter revolves more around family activities that I grew up with. We would always go to church as a family to reflect on the true reason for Easter and then we would go over to my grandparents house with our other 10 cousins and have an Easter egg hunt! We would all work together to find our Easter treats that had been carefully hidden in my grandparents' backyard (did I mention it was a HUGE backyard?!!). Needless to say, it was a task that kept us occupied until Easter dinner was ready. My grandma put on quite the show - making everything down to homemade mustard to go on the delicious ham. Yep, it was a lot of fun and cultivated such great memories of our family. Preheat oven to 350F. Line a 12 cup muffin tray with paper liners. Separate the eggs placing the egg whites in the bowl of a stand mixer. Using the whisk attachment, whip the egg whites on medium-high speed until frothy. Add the cream of tartar and continue to whip until soft peaks form. Gradually add 1/4 cup granulated sugar while mixer is moving and continue whipping until stiff peaks form. Scrape into a medium bowl and set aside for later. In another medium bowl, whisk together the flour, baking powder and salt. Set aside for later. In the bowl of an electric mixer beat the butter until fluffy (about two minutes). Add 3/4 cup of sugar and beat until fluffy. Scrape down the sides of the bowl and add egg yolks one at a time, beating well after each addition. Scrape down sides of the bowl and add vanilla. With the mixer on low speed, add the flour mixture in three additions, alternating with the buttermilk, beginning and ending with the flour mixture. Once just combined, fold in the mini eggs. Then fold in the egg whites, being careful not to overmix or the batter will deflate. Divide batter equally among the prepared muffin tin. Bake 18 minutes or until tops spring back when lighly pressed. Do not overbake!! 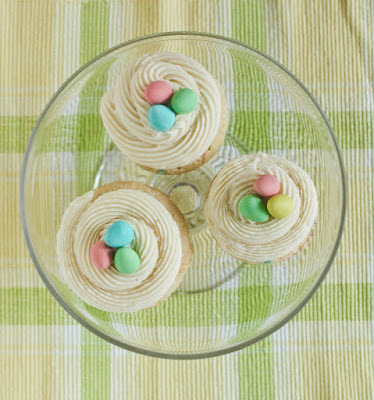 Frost with buttermilk frosting (recipe below) and garnish with three mini eggs for each cupcake. Beat butter in the bowl of stand mixer on medium-high speed. Add icing sugar and vanilla and mix until well incorporated. Add buttermilk 1 tbsp at a time until frosting is the right consistency for piping. Thats that! 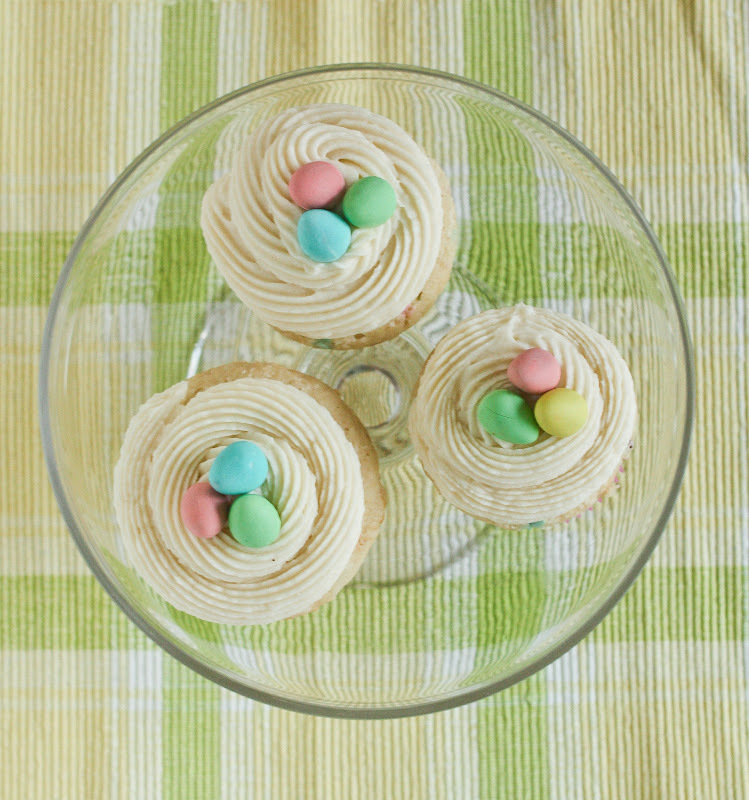 The buttermilk frosting tastes a lot like a cream cheese icing, but with a far better piping consistency. 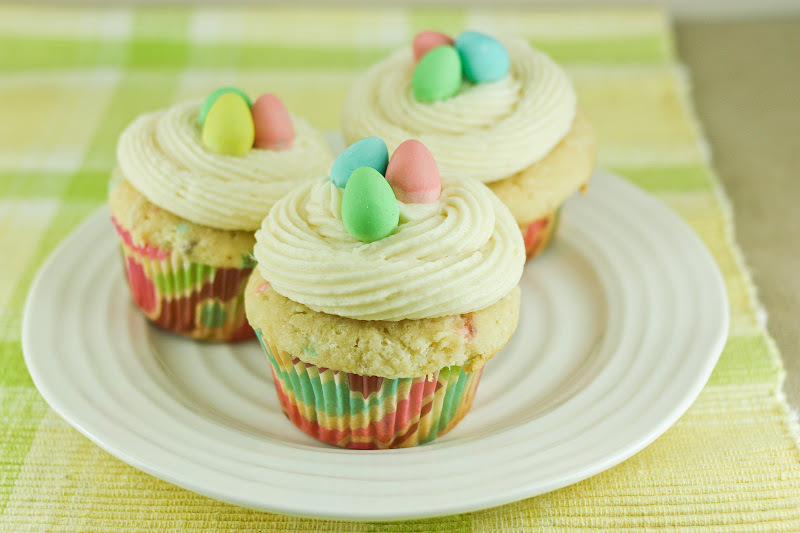 Give these a try this weekend for your Easter get together whether its for friends or family or both. They're sure to be a hit. 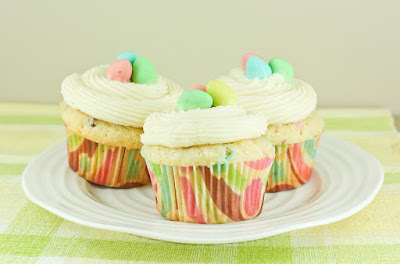 This post has been linked up with the Recipe Party at the Sweet Spot. Head on over there and check out what other treats bloggers have linked up this week.